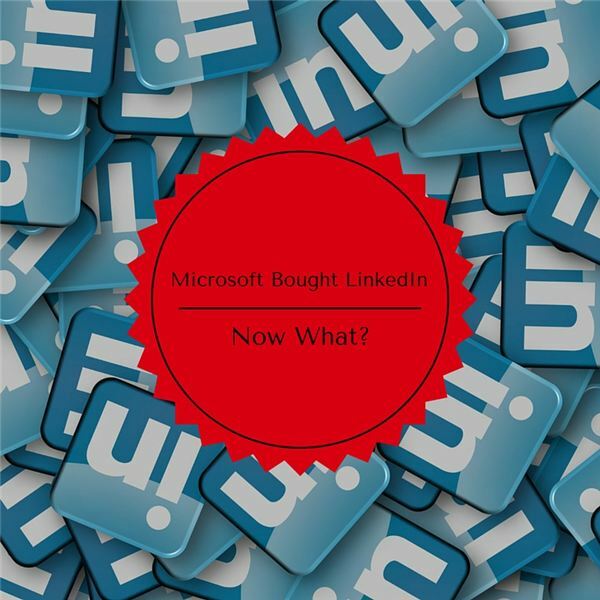 Many heads were scratched and shaking in disbelief this June when Microsoft announced it was acquiring the popular business social network LinkedIn for just over $26 billion dollars. What was Microsoft thinking? First off, LinkedIn is a profitable company. Not as profitable as some wish they were, but with an EBITDA margin of 26% and free cash flow of $300 million, LinkedIn was doing pretty well on their own. LinkedIn doubled the number of members using the service from 200 million users to 400 million users by the end of 2015. They also have a number of revenue streams coming from their Talent and Marketing solutions divisions as well as their premium subscribers. With a rapidly growing user base and revenue channels, LinkedIn looked forward to another successful year. Enter Microsoft. CEO Satya Nadella stated “Together we can accelerate the growth of LinkedIn, as well as Microsoft Office 365 and Dynamics as we seek to empower every person and organization on the planet." With that came a $26 billion dollar check for Microsoft to acquire LinkedIn. Nadella alluded to this, but integrations with Office 365 and Dynamics are going to be the first focus. Users will be able to see more information about contacts in Outlook for example. I can see how having LinkedIn contacts in something like Outlook or Dynamics may be handy, but LinkedIn in Word or Excel? I don’t see it. It’ll likely be a year or two before we see any meaningful changes in these products related to the deal. Some pundits are worried the LinkedIn acquisition will turn out like some of Microsoft’s other high profile acquisitions like Nokia and Skype. In both of those cases, Microsoft wanted to preserve the brand and identity of those companies and left things largely untouched. When Microsoft acquired Nokia’s Devices and Services business in 2014, former Nokia CEO Stephen Elop remained. Likewise, when Microsoft acquired Skype in 2011, they left then Skype CEO Tony Bates in place. As we know, Microsoft recently wrote off the remaining bits of their Nokia division (an 8 billion dollar loss) and Skype, while still popular isn’t setting the world on fire like it once was. Microsoft hasn’t commented on Skype’s revenues for several years – effectively lumping it into a larger category. Does LinkedIn have a shot at success or is it going to end up like some of Microsoft’s other notable failures? Of course it’s impossible to say, but not all of Microsoft’s acquisitions are a mistake. Take a look at Mojang. With a single product in their portfolio – a little something called Minecraft – Microsoft broke even on their $2.5 billion investment during the 2015 fiscal year. With Minecraft still selling like hotcakes, Microsoft is clearly making a nice profit on their 2014 acquisition. LinkedIn has a lot going for it – first, it’s really the only major offering to link business professionals together. Facebook could try to make a move into this space, but it would be an uphill battle – especially now that LinkedIn has Microsoft’s deep pocketbooks to help. The other thing to realize is that LinkedIn is rapidly growing – without another major competitor in the social business scene, LinkedIn should be able to maintain their current upwards trajectory. Nokia and Skype were different animals. Microsoft was desperately trying to gain footing in the mobile device arena. In order to beef up their capabilities, they acquired the Nokia Devices division. Nokia didn’t fail because of things Nokia was doing, but because they were tied to Microsoft’s unpopular mobile OS. Skype’s battle may or may not be profitable for Microsoft, but considering the number of free and easy to use competitors to Skype, it wouldn’t be a surprise if Skype was losing money for Microsoft. It’ll be interesting to keep an eye on how the LinkedIn and Office integrations will work. Will they anger users like Microsoft Clippy back in the 90s or can they truly provide something groundbreaking and useful to end users? Feel free to post your comments below!